It’s always good to encourage your kids to be physically active, and for many this may include participating in organized sports. Appropriate clothing and pads will help protect their bodies from injury, but don’t forget to protect their eyes as well: every year, tens of thousands of children suffer sports-related eye injuries, and almost all of these could have been prevented with appropriate protective eyewear. For athletes who see well with each eye (with glasses if necessary) protective eyewear for sports is a good idea. For athletes who have good vision in only one eye, protective eyewear is an absolute must! They simply can’t afford to take a chance that the one good eye will be injured! 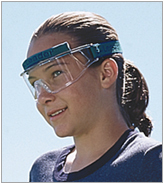 Let the staff of Kidspecs Optical show you the latest in sports protective eyewear. If your child does not need a prescription but simply needs protection, out staff can give you other options including tips on buying sports goggles at a sporting goods store. And we can advise you as to where to find face guards for baseball/softball batting helmets and protective visors for football helmets.